Rich Mountain Conservation District Board of Directors meet on the last Tuesday of each month. 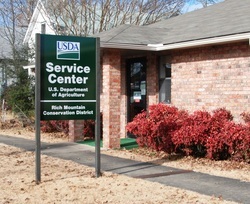 Meetings are held at 1:00 p.m. in the Conference Room of the USDA Building located at 508 7th Street in Mena. All meetings are open to the public. Please call before attending to be sure that changes have not been made. Why Do We Need Conservation Districts? Conservation Districts are “unique” local units of State Government that utilize state, federal and private sector resources to solve today’s conservation problems. The guiding philosophy of all Conservation Districts is that decisions on conservation issues should be made at the local level, by local people, with technical assistance provided by government. The locally elected five-member board of directors makes all decisions regarding the District’s programs and activities. The directors hire qualified staff to conduct and carry out the programs and activities that they have approved. These programs provide technical help, information, and awareness to assist people in the District to properly manage their natural resources. Created to serve as stewards of natural resources, Districts take an ecosystem approach to conservation and protection. Conservation Districts are referred to as “gateways” in their local communities. They provide linkages between land managers and a host of conservation service providers that include state, federal and local governments, conservation organizations, and Internet resources. Conservation Districts continually scan the needs of their local communities, work in partnership with others involved in conservation to set local priorities, and develop action plans to solve natural resource problems. The delivery of these efforts by Conservation Districts allows citizens to manage their private lands for a cleaner, healthier Polk County. It allows the public a point of access in their communities when questions arise on how to manage natural resources. District funding sources include state appropriations, county and other local governmental appropriations, federal and state grants, and other locally initiated and conducted fund raising activities. State appropriations, grants and county appropriations complete the operating budget, which allows the District to conduct programs focused on solving resource issues and educating land users on how to better care for our natural resources. The relationship between Conservation Districts and the US Department of Agriculture's Natural Resources Conservation Service (NRCS), formerly known as the "SCS," has been long standing. As noted above, the NRCS was originally formed to address the crisis of the Dust Bowl, and the legislation establishing local conservation districts was created shortly thereafter. Since then, NRCS and Conservation Districts have had a close working relationship within the districts, with NRCS appointing a local District Conservationist to provide technical assistance to Conservation Districts, as well as acting as a liaison between the district and federal programs. Local offices of the NRCS also frequently employ other specialists, such as soil conservationists and engineers, to provide technical assistance to the Conservation District Board.